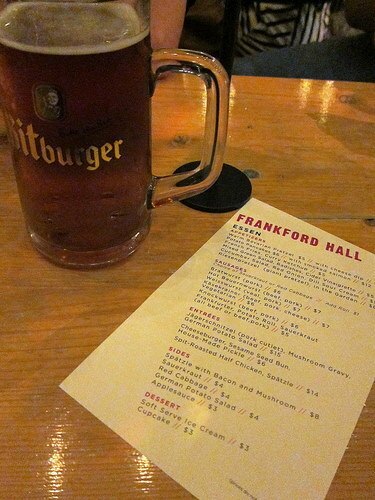 We stopped by Frankford Hall to celebrate Indy Hall’s 4th birthday. The crowd wasn’t the Rittenhouse crowd that K and I had witnessed during our last quick visit. It was also a beautiful night, so being outside was beyond awesome. You order your food at the window and get a number. Then one of the servers will bring everything out to you. As far as beer goes, there are several bars to choose from with a variety of beers. 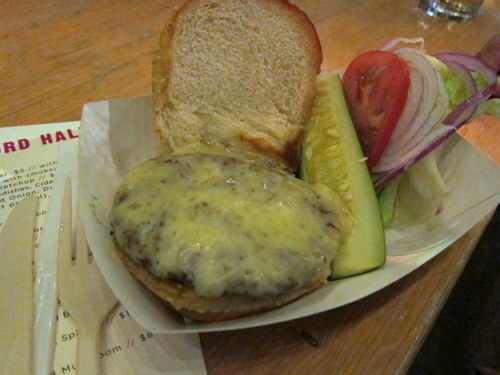 I asked M how her burger was and she loved it. And they have a large condiment table and she raved about the curry ketchup. I also asked for her pickle, since she didn’t eat it, and damn, this pickle was awesome! I’m not sure if they make these there or if they buy them, but they were super fresh and only lightly pickled and I loved it. K’s hot bauernwurst was good, but not spicy at all. 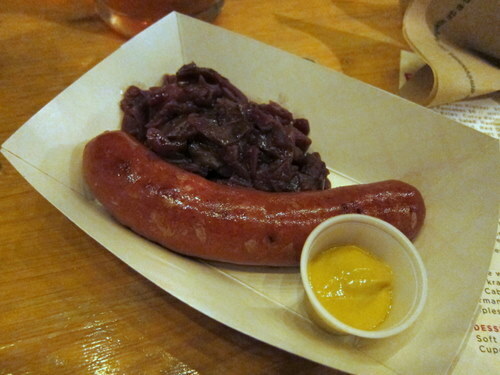 You get a choice of sauerkraut or cabbage when you order a sausage. He went with the cabbage because I suggested it. It’s good! 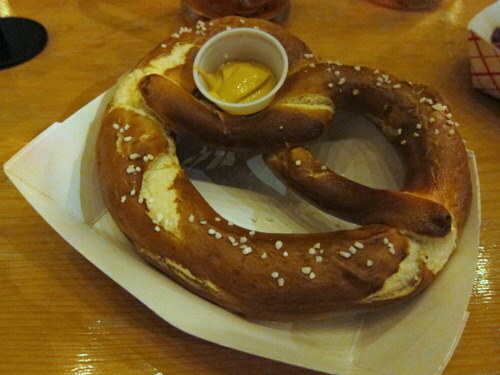 And here’s my giant pretzel! It’s big, it’s warm, it’s good. It really does go well with beer. We really had fun. I love the whole picnic tables everywhere and casual outdoor atmosphere. The beer and food treated us all well. Yea the crowd has gotten a lot more “local” to the Fishtown area. Given the choice between yuppies and hipsters, I have to go with the hipsters.